Click the button below to add the T1 jukebox remote TouchTunes compatible to your wish list. Press On Products™ is proud to present our new custom designed and engineered T1 jukebox remote. The T1 remote is fully compatible with all TouchTunes jukeboxes that are capable of working with the TouchTunes 433 MHz blue RF remote. This includes jukeboxes that use the older Touchtunes grey RF remote when the grey remote is in 433 MHz mode. We take pride in improving upon existing technology and adding our own spin to the user experience. As you will find with our re-engineered T1 jukebox remote there are extra features and options that have been added to improve the users overall experience. With our SureGrip™ plastic molding material the remote is less likely to be dropped due to the natural working environment that these jukebox remotes find themselves in. That translates to less repairs and replacements of the remote. Specifically for you the coin-op vending and amusement operator, that is less service calls and repairs for damaged or lost remotes. The T1 remote reduces the loss of revenue because of its durable design and affordable price. Every Press On Products™ T1 jukebox remote includes the following features listed below. INCLUDED: AN EXTRA BATTERY COVER! FREE! No more duct tape! Two AA batteries that will last twice as long as the AAA batteries the Touchtunes jukebox remote uses. 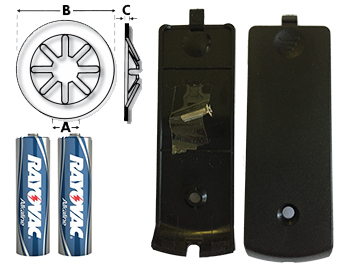 Two screws and retaining fasteners, two battery covers, each battery cover comes with its own screw. The T1 jukebox remote is fully compatible with ALL Touchtunes jukeboxes that can use the 433 MHz blue remote. Extra set of volume control buttons on the jukebox remote. Even if the location damages one of the volume buttons, you still have a complete extra set. Improved range over the current Touchtunes jukebox remotes. Improved molding shell that is shatter resistant up to 8 feet. Supports all of the 433MHz jukeboxes currently using the blue remote or any jukebox that is using the grey remote set to the 433MHz frequency. Compatible with Allegro, Maestro, Maestro-II, Ovation, MX, MX-1, Virtuo, & Playdium Jukeboxes and any other TouchTunes jukebox currently using the 433MHz blue remote or any jukebox that is using the grey remote set to the 433MHz frequency. We tested this remote for three weeks and the remote was much better than we thought. Our accounts are really unforgiving on these remotes and this one is simply better in every way. Saved me 3x in real $$$ as one of my accounts is notoriously hard on these remotes and either loses the remote or drops it repeatedly. This remote doesn't seem to get lost or misplaced and holds up to the abuse so far. Changed all my accounts to this T1 jukebox remote it's perfect! Perfect remote with the leash cord to keep people from constantly breaking the remotes by dropping them. Saved me $$$ already! I put the extra battery covers in all of my service trucks just in case. Honestly, the fact that there is a screw to hold the battery clip in place is already making this remote the clear choice. Instant hit! I tested the remote in a Bar that is really hard on their remotes to see if this would hold up to being dropped all the time. YES! the grip on the remote is much better and the remote holds up fantastically. Bought 25 more, problem solved! Exceptionally well designed and affordable! Will be replacing all of my other remotes with these.